Grant Davis signs boxed sets of creation featuring Ã¢‚¬Å'Little Red Riding HoodÃ¢‚¬? and Ã¢‚¬Å'Jack and the Beanstalk.Ã¢‚¬? Beavercreek resident Grant Davis estimates he talked to nearly 1,000 people about a special pop-up book this fall. In October, Davis and design partner Jason Allemann were at the Washington Square LEGO store to sign boxed sets of their creation featuring "Little Red Riding Hood" and "Jack and the Beanstalk." "It was weird being the center of attention there, with lines of people waiting for me to sign their set," Davis said. "I don't think anything, save maybe being incredibly narcissistic, can prepare you for a situation where so many people enjoy a thing that you made enough to spend their money on it," he said. Davis and Allemann's creation is the LEGO Group's first-ever pop-up book. It features two walls hinged at the base that open to reveal LEGO scenes of the two well-known fairy tales. In addition, users can create their own scenes. Davis, a student at George Fox University, has lived in Beavercreek his entire life and began playing with LEGO Bricks at age 3; he was homeschooled, graduating from high school in 2016. He believes LEGOs have helped him in school, more than school has helped him build LEGOs. "Since I started at a young age, I was creating and using complex shapes that I could have calculated with trigonometry, for example, long before my mathematic skills reached a point where I could have utilized them," Davis said. "In particular, at university a lot of the special problem-solving I've needed to do has been slightly easier for me than other students because I had been using those skills for years while building with LEGO." 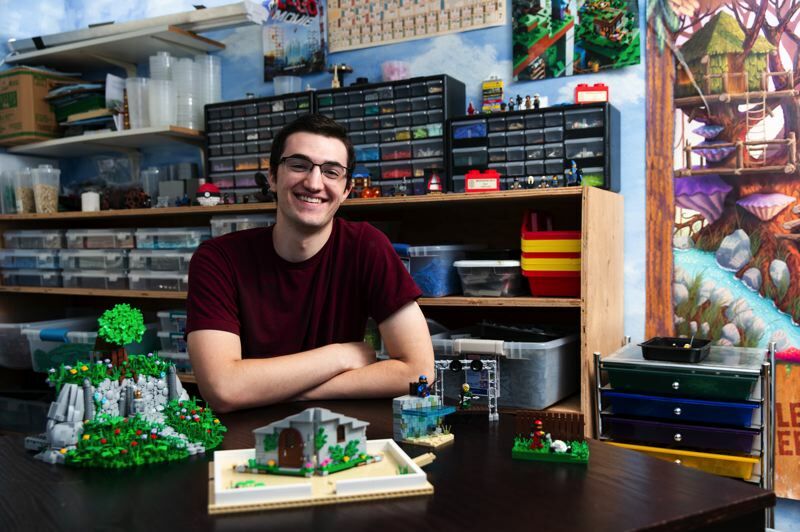 Currently, Davis competes in LEGO building competitions online and travels to conventions around the country to display what he makes. Davis said he always knew he could make a LEGO pop-up book, but needed to mature and improve his building skills to make that happen. 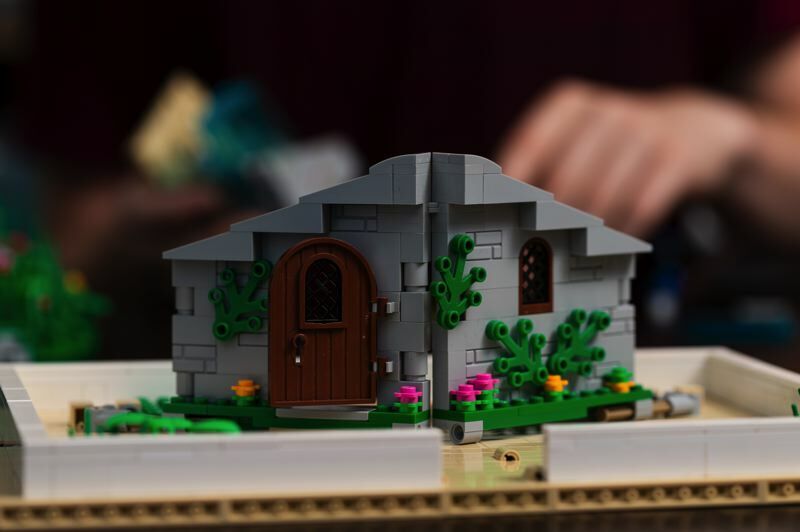 Originally, he intended to make book inserts based on different LEGO themes, but once Davis brought Allemann in on the project to help him with the pop-up mechanism, it was "Jason who suggested we move to a fairy tale-centric set of inserts." In their first pitch to the LEGO Group, the two young men included "Little Red Riding Hood" and "Humpty Dumpty" inserts. "Once the set had been chosen to become a product, and after many long discussions about what would sell well, the designer who was working on adapting our original model into a LEGO set decided to switch 'Humpty Dumpty' to 'Jack and the Beanstalk' instead," Davis said. "I love the switch, as the function in the 'Jack and the Beanstalk' insert is super ingenious," he said. Davis noted that he and Allemann, a fellow LEGO fan from Ottawa, Canada, emailed back and forth and had a couple of Skype calls as they worked on the project. They first met in person when they both attended Brickworld Chicago in 2016, and then Allemann came to Portland for the boxed set signing. Anyone can submit a creation to the LEGO Group by building a model and submitting the design to LEGOIdeas.com, Davis said. On that website, people can view and vote for projects that they want to see turned into a LEGO set. If a particular set gets 10,000 votes, then LEGO and the LEGO Review Board will seriously consider producing the project. "At the time that we got 10,000 votes, eight other projects also hit that mark around the same time. At the end of May in 2018, the results of the review period were finally announced, and out of the nine, only the pop-up book was chosen to be a set," Davis said. He noted that it took about a year to get the 10,000 votes. Davis is studying electrical engineering at George Fox University, but calls that degree his "fallback plan." After he graduates, he plans to apply to work at the LEGO factory in Denmark as a master builder. "If I got the job, I would spend my days designing sets, like what I did with the pop-up book," Davis said. Even though Christmas is over, boxed sets of the pop-up book are still available for $69.99 at Washington Square's LEGO store, said manager Mike Tsai. The set has been "incredibly popular."